If you’ve ever loved a beagle, you know that the adorable little tri-colored hound is not so much a dog as a nose on four legs. And not just any nose. No, this nose is fine-tuned to the tempting smells of edible items that waft past on the slightest of breezes. The beagle is indeed a hunter – a hunter of elusive snacks. I think beagles in general, and the four I knew and loved specifically, have a fairly wide definition of what constitutes “edible.” Just run through a list of somewhat questionable delicacies with any handy beagle, and these might be his or her responses: Dead animals? Sure. An entire stick of butter? Of course; how can you even ask that! Cat poop? Yes, please. Bird seed? Yeah, I’m game. One prime snack-hunter example was my sister’s beagle, Casanova, who could go into an amazing stealth mode whenever unattended food presented itself. One minute, there’s a house full of my siblings, nieces and nephews, clearing the Easter brunch table, bustling to-and-fro from kitchen to dining room; and the next minute there’s a beagle standing in the middle of said table eating a block of cream cheese. How he got up there with all of us around, and without his tags ever jingling once, is one of life’s great mysteries. 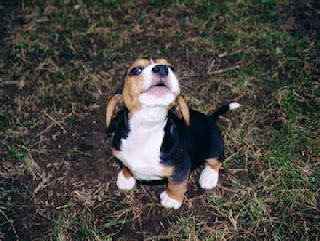 The story is probably passed to beagle puppies as part of their training and oral history. 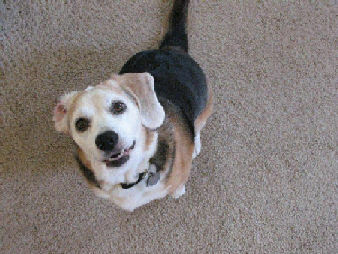 Our own beagle, Bailey, was likewise—to put it mildly—a chow hound. (Luckily she was addicted to chasing the laser light, so we’d “buzz” her around the house three times per day every day to help her maintain her girlish figure.) She was known to eat many of the items mentioned above, but by far her favorite thing to eat was people food. My husband and I got her at just eight weeks old when we were living in Ontario, Canada attending graduate school. I’d had dogs before growing up (including an amazing beagle named Barney) but my husband was new to the whole dog thing. We had grand ideals: at night, she was going to sleep in a crate, not our bed; in the living room, we designated a dog bed as hers, no sofa surfing for our girl; and, finally, she was going to eat dog food, not people food. We did not want to have a beggar on our hands! Well, after three nights of whining, Bailey was out of the crate and in our bed. (After all, we lived in an apartment building at the time and we were just concerned about the neighbors…). As for the sofa, she claimed that pretty much right away. She was so tiny! So cute! How could you not want her on the sofa and in the bed with you? Still handful-sized, it was only the mornings when we awoke to find her sleeping on one or the other of our heads for warmth that we regretted our decision. As for the begging… well, let’s just say that this girl honed her craft over a lifetime, but even from a young age she could widen those big brown eyes and look at you just so from under her concerned brow in a way that turned your arm, quite against your will, into a food-dispensing lever. Later in life she added a cheek-sucking-in move that I wish we’d photographed. She could give you a hypnotic “I haven’t eaten in hours, I mean days” look, and the next thing you know you’re handing over the last bite of your ice cream. Bailey could beg a morsel off the Scroogiest of eaters. She could remember every spot where she’d ever found a random bit of, say, dropped barbecue in the park and drag you to it each time you got within a quarter mile. She could poke the cupboard door with her nose until it opened, revealing the trash and all its glorious tidbits therein. (We had to start tying it shut with a kitchen towel.) Once, she literally took candy from a baby—and it looked just as easy as they always say it is. But the most memorable food-related thing Bailey ever did happened one day when we were still living in that old student-housing apartment building. My husband’s friend had dropped by unexpectedly. Just as we opened the door to greet him, our neighbor walked out his door. Bailey, who’d never bolted from the apartment before, flew out our door and into the neighbor’s apartment, where his roommate sat on the sofa eating pizza. She leapt up on the sofa next to him, snatched the last piece of pizza off his plate, and raced out to devour her treasure in the hallway! She must have smelled it through the thin walls and plotted her perfect crime. I can just picture her, every time she smelled pizza next door thinking, “If only someone would come to visit at the exact same time that they open their door!” I imagine her waiting. Plotting. Calculating time, distance and speed. Until that one perfect storm of simultaneously opened doors while hot, cheesy pizza waited in the hands of an unsuspecting student. You never saw a happier dog. Or a more surprised college kid. Wonderful story, Jackie. Dogs like people food for one reason. It's edible. If it eats, they want it. Our leviathan pup has finally learned that Crocks and other plastic shoes are not food, either for dogs or for people. So I guess our footwear is safe now. And he no longer lusts for our TV remotes, thank goodness for that. But this monster still can make you feel guilty for taking a bite of dinner by looking at us with that look you described. Ah, it's a dogs life! Bailey sounds like such a fun pet and lovable too. My very first dog was a beagle. He made a wonderful pet. I don't recall that he ate pizza, but he got plenty of leftovers. Love the pictures. Beagles are so darn cute. The stories are great. Thank you. Our new pup is 1/2 beagle, 1/2 German Shepherd...except when food is involved, and then she is 95% beagle! Laughed all through this. I had a poodle who was the same way when it came to people food. She would grab McD hamburgers out of my little boy's hand and run. Finally had to buy one for her when we had burgers so the poor kid could eat his! P.L. - that is so funny about having to get her her own burger! Smart pup! We had a beagle for 10 years. We relates to everything you said. Yes our beagle ate everything. On Easter morning we would hide little chocolate Easter bunnies for our little son to find. Well, every Easter morningit was a race between Tryxie and are son as to who got the most chocolate bunnies. Ut really was no contest. Tryxie would put her nose down go right to a bunnies and eatit..wrapper and all. There was also Tryxie's Thanksgiving day caper. We lived in a rural area and dogs were aloowed to roam free. One Thanksgiving morning, a neighbor took her 20 lb turkey out of the oven and put out on the back porch to cool down quickly because guests had arrived and she was running late. Tryxie was out in our backyard and all of a sudden took off like a bat. Mind you this neighbor was about a mile away. About 15 minutes later I got an angry phone call to come and collect my dog because she had eaten so much turkey she was now sound asleep and didn't want to move! I went and collected my dog and brought a cooked turkey from a friend who owned a turkey farm and had a cooked one left over. She got cancer and she had to be put down. When we took her to thevet that last time, she walked in meekly with her head down and when it was time for her to be taken in, own her own she looked at each one of us, licked us on the leg and turned and walked off. I must stop now.